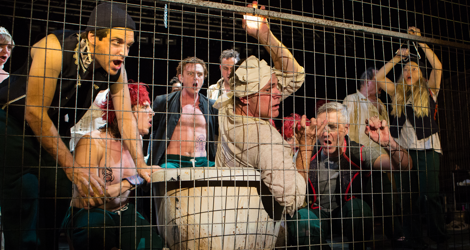 Soulpepper’s production of Marat/Sade is a huge disappointment. Peter Weiss’s 1964 play is generally acknowledged as one of the greatest plays of the 20th century and Soulpepper is generally acknowledges as one of the most important theatre companies in Canada. Yet, director Albert Schultz, in trying to make the play relate to the upcoming national election, narrows the play’s relevance and in in trying to make it more immediately appealing, makes it superficial. Besides this, Schultz loses sight of the central questions of will and power imbedded in the original setting. It is therefore ironic that a small indie company like Soup Can Theatre was able to give the play a more intelligent production in 2011 than a high-profile company like Soulpepper is giving it now. 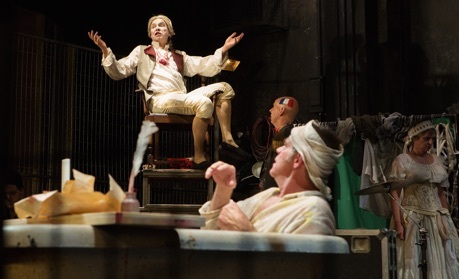 The full English title of Marat/Sade by German playwright Peter Weiss sets out the essentials of the play’s time and place: The Persecution and Assassination of Jean-Paul Marat as Performed by the Inmates of the Asylum of Charenton Under the Direction of the Marquis de Sade. The play is based on the historical fact that the infamous Marquis de Sade (1740-1814), imprisoned in the insane asylum of Charenton from 1803 to 1814, wrote and directed plays to be performed by the inmates. The performance takes place in 1808 when France is a monarchy again with Napoleon in power. The subject of Sade’s play, however, is the assassination in 1793 of Jean-Paul Marat (born 1743), a leader of the French Revolution, by Charlotte Corday, a woman with Girondist, counter-revolutionary sympathies. 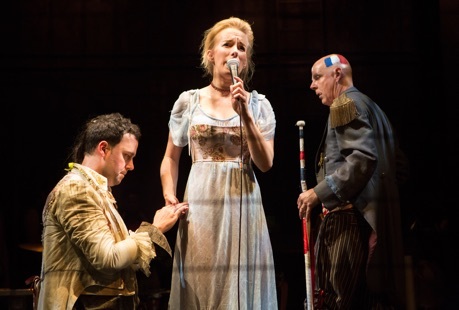 The play may be focussed on the events surrounding the French Revolution, but its debates concerning the motives behind a popular rebellion, the flaws of capitalism and the futility of war, not to mention the nature of theatre, have all given the play an enduring relevance. The difficulty of the play is that the performers must not only portray their characters as an inmate but portray that character portraying another character. Throughout the action there is a tension within each actor between performing the role as written and using the occasion for personal expression. Though a nihilist, Sade, as director, jumps on any deviation from his script, while Dr. Coulmier (1741-1818), who believes in theatre as form of enlightened therapy, objects when Sade’s script becomes objectionable or when certain patients become too unruly. In 2011 director Sarah Thorpe updated the setting to 1957 at McGill University’s Allan Memorial Institute and identified Dr. Coulmier with Dr. Donald Ewen Cameron (1901-1967), who used patients for experiments in shock treatment, sleep deprivation and hallucinogens without their consent. While the play needs no updating, Thorpe’s version preserved one of the central aspects of the play – that it is performed by inmates of an insane asylum. This aspect is essential since Weiss wants us to compare the “madness” of the prisoners both with the madness of the events they depict and the supposed sanity of their keepers and the the world-conquering Napoleon outside. Director Albert Schultz also wants to Canadianize the play, but he moves it to the Collins Bay Institution in Kingston, Ontario, in the present. The main problem this poses it in completely doing away with the setting as an insane asylum and with it the sane/insane paradox built into the themes, acting style and action of the play. Schultz’s version does ask whether we are more free than those in prison, but he misses Weiss’s more profound questions about the nature of being and acting. Like Thorpe updating, Schultz’s also creates the problem of who the character of the Marquis de Sade is. In Weiss’s original he is the sane playwright and contemporary of Coulmier, incarcerated with the insane patients because of the objectionable nature of his writings. Updating the action means the character cannot be the real Marquis de Sade. So who is he – an inmate who actually thinks he is de Sade or one merely playing that role? Either choice considerably lessens the character’s power and creates confusion where there should be none. What definitely go missing from Schultz’s version is the sense that everyone on stage in enacting de Sade’s play and that he is in charge of the action. Schultz has Diego Matamoros as de Sade oversee the action on high, but has set up Brendan Wall as stage manager and prompter, thus diffusing de Sade’s role as the controller of the action. One of the best aspects of the Soup Can Theatre production was that it retained the atmosphere, stated at the very start of the play, that none of the actors have ever appeared on stage before. Schultz shoots this idea almost completely out of the window. Some of the actors in non-speaking roles like Caroline Gillis and Liisa Repo-Martell convey this idea through the insecurity they allow to imbue their actions. Otherwise, all the others actors act like professional actors in any other kind of play. This ruins the layers of acting that Weiss’s original demands and it destroys the excitement inherent in the original of the patients gradually coming to realize the relevance of the roles they are playing to their actual situation. Schultz also misses the notion that the play is a one-time-only event being staged not in a theatre but in a facility not meant for stage productions. Schultz shows some awareness of the original set-up by having the house lights up in the Baillie Theatre when we enter or whenever the Coulmier interrupts the production. Otherwise, once the action starts, Schultz allows lighting designer Kevin Lamotte far too extensive a range of lighting cues as if Schultz had forgotten that the play were taking place in the Collins Bay Institution. Schultz has has Mike Ross write a new score for the show, but Ross has also forgotten that the songs are meant to be written by a non-professional for non-professional performers. His music covers a wide range from Kurt Weill to cheesy 1970s-style ballads to punk rock and heavy metal. The problem here is twofold. The music is generally too upbeat given its subject matter and, when it imitates a particular style of the ‘70s or ‘90s, it causes Schultz to have the music staged to parody those styles. Such parodies may be funny, but they have nothing to do with the play, trivialize the import of the lyrics and encourage a superficial response to the action. The performances of the 21-member cast are extremely uneven. Given that Schultz has shrouded the true identity of the Marquis de Sade in mystery, Diego Matamoros forges ahead and plays the role as if his character actually were the historical de Sade, as Weiss intended, and not some prisoner with a de Sade obsession. His performance is not very different from that of his chilling Satan in Stephan A. Guirgis’s The Last Days of Judas Iscariot in 2009, a world-weary intellectual whose cynicism has led him to despise both mankind and nature. The performances of Liam Morris and Heather Marie Annis (yes, Morro or Morro and Jasp) as Jean-Paul Marat and his assassin Charlotte Corday were high points of the Soup Can production. Both spoke their lines as if their mental problems kept them slightly disconnected from their meaning which is the precisely the effect Weiss wants to achieve. In Soulpepper’s production both performances are disasters but for completely different reasons. As Marat, Stuart Hughes does absolutely nothing to suggest that he is a first-time actor who is paranoiac. He speaks Marat’s lines as if he were playing the historical Marat the idealist, unaware that everything that issues from his mouth was written by his ideological rival de Sade. The multiple ironies of Weiss’s text are thus lost. Katherine Gauthier gives an appallingly bad performance as Charlotte Corday made worse by Schultz’s inattention to detail. The actor who plays Corday is said to suffer from narcolepsy. In reality this involves excessive daytime sleepiness and sudden loss of muscle function brought on by emotional reactions during which the subject is conscious. Schultz has decided that Gauthier will simply fall down in a dead sleep when she is done speaking. This gets laughs, but it is hardly represents the medical condition that Weiss had in mind. The actor playing Corday should be seen to be sleepwalking through her part which is meant to make us ask whether the real Corday, obsessed with killing Marat, were not similarly walking through a dream. Gauthier’s uninflected speaking voice and well as her miked singing voice are painful to listen to and suggest nothing about her character’s state of mind. While Deborah Drakeford as Marat’s caregiver Simonne does give the impression of a first-time actor doing her best, neither Frank Cox-O’Connell as the vituperative preacher Roux nor Gregory Prest as Corday’s would-be lover Duperret bother to portray their characters as amateur actors playing difficult roles. If we ignore that that crucial level is missing, both give compelling performances. A major surprise is the revelation that Prest has an excellent singing voice – full, secure and with a wide range. While C. David Johnson’s Coulmier is too pompous and ineffectual to inspire much fear, Oliver Dennis frequently steals the show as the enigmatic Herald. Speaking in rhymed couplets to set the scenes as well as comment on them, Dennis’s Herald appears to be taking on the role of lackey to hide his real role as agitator. Whereas Weiss’s original play operates on several levels of irony, here it falls almost entirely to Dennis to bring out the irony in the action through the wryness of his commentary. For those unfamiliar with the work, Weiss’s play does not conclude as it does here with the Herald escaping from the prison/asylum. The mere fact that Schultz would end the play this way shows how little he understands it. If the inside world is meant to be the distorted but perhaps truer mirror image of the outside world, there is no point in escaping the one for the other. Schultz has also adapted the Herald’s final speech so that the self-important Napoleonic regime of 1808 parallels the self-importance of the Conservative regime in Canada under Stephen Harper. Unfortunately, this is not done with enough subtlety so that Schultz appears to have narrowed the focus of Weiss’s play to a single issue. In doing this and in trying to garner as much humour as possible from the music, Schultz waters down the play and removes the deep ambivalence inherent in the original towards revolution. Is it possible for a revolution to be a necessary corrective without transforming into a reign of terror as it did in France? That is the question Weiss’s play asks, but that Schultz’s production does not. Photos: (from top) Stuart Hughes (in bathtub) and the Marat/Sade ensemble; Diego Matamoros as de Sade and Stuart Hughes as Marat; Gregory Prest as Duperret, Katherine Gauthier as Corday and Oliver Dennis as the Herald. ©2015 Cylla von Tiedemann.